Early reservation is recommended to avoid disappointment. Whilst all attempts will be made to hold to the above prices, they may be subject to change without notice. Pets are welcome in several camping cabins and in the campground, a small fee required. All cabins are non-smoking. 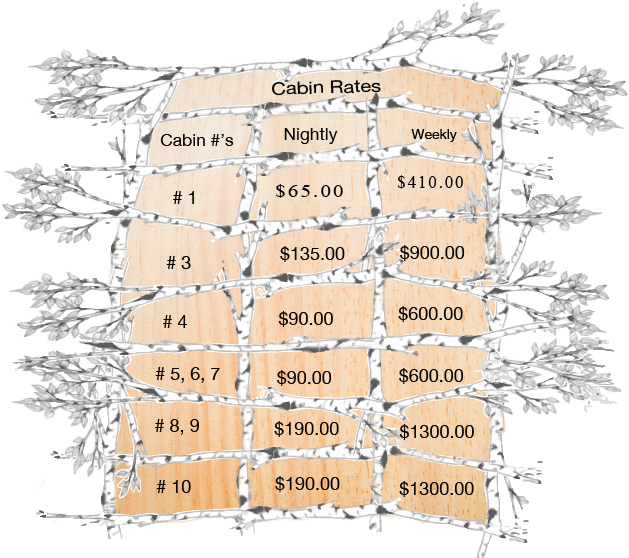 There is a small fee for extra persons staying in cabins as well as the camp sites (see rates page). Enjoy your stay, however please note: Be kind to our property, you will be charged for stolen items and any damage to the Ovens Park as well as excessive garbage left on your site or in the fire pits. All overnight guests require a valid visa or mastercard number. Full payment is due in advance and processed at the time your reservation is made (visa or mastercard only). All campers, including non-reservation walk-in campers, must have a valid visa or mastercard. Guests have 48 hours from the time reservation is made to change plans or cancel, refund will be given at that time, less $8 Administration fee. After that date there are no refunds but we can change the dates for you. No refunds for campfire bans. If there is a change in your reservation, the office must be notified before you check in, no refunds are given after your stay with us has begun. Wood can be purchased from our main office. Wood is NOT permitted to be brought in from outside of the park at any time. Do not pick any flowers, plants, cut down any of our trees or burn any dead branches or leaves. The Ovens Park maintains a fragile eco-system, any unnecessary disturbance will not be tolerated. Quiet time is from 11 pm to 9 am, no fires burning after midnight. Single Site Accommodates: A Family of 2 Adults and 3 Children under 16, 1 vehicle. No trailers/campers/RV’s are permitted on the tent sites. Rates Include up to 2 adults, 3 children under 16 and 1 vehicle. Single Site Accommodates: A Family of 2 Adults and 3 Children under 16, 1 vehicle. Park Admission included with all RV/trailer sites, including access to the pool, gold-panning beach and sea cave trail.